It's official! The former Miss World and one of the most sought after actresses in Bollywood - Aishwarya Rai Bachchan is preggers! It is the time to raise a toast and clink glasses at the Bachchan mansion. It was on a social networking site that the senior Bachchan announced his happiness and excitement to be a grandfather. Just seconds after the declaration, the entire film fraternity and the fans of the Bachchan family started pouring in congratulatory messages. It was in 2007 that Abhishek and Aishwarya tied knot and soon after, they were being questioned about their plan to extend the family. Finally after four years, the couple is eagerly waiting to welcome their bundle of joy! The hazel-eyed beauty will be the new entrant in the 'yummy-mummy' bandwagon of tinsel town. Our Ash is all excited to play the role of a mommy in real life. However, her reel life would take a back seat for the time being, and she will have to let go of many crucial assignments including Madhur Bhandarkar's Heroine. Amid blissful days and nervous nights, 37-year old Aishwarya needs to take good care of herself, now. How will Aishwarya's journey to motherhood be? Ganesha, with the help of Vedic astrology, predicts for her . Ganesha notes that Jupiter has occupied 5th House of progeny in Aishwarya's Natal chart. Lord of the 5th House Saturn is retrograde and is in Ardra constellation ruled by Rahu. 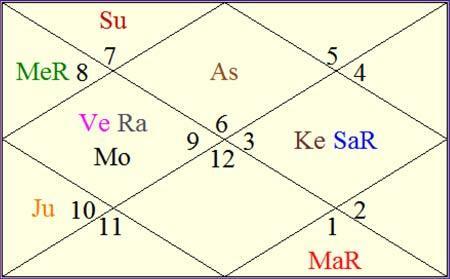 It is also to be noted that Saturn is placed with Ketu. Currently she is under the influence of Rahu major period, Sub period of Jupiter and sub sub period of Venus. Ensuing sub period will be of Sun, which will rule from 23rd September, 2011 to 6th November, 2011. Transiting Jupiter is currently aspecting 2nd House of family. Ganesha notes that Aishwarya's 5th House of progeny is weak due to three reasons. First being debilitated Jupiter's placement in the 5th House and second and third reasons are because Saturn the 5th Lord is retrograde, in Rahu's constellation and placed with Ketu. This is the prime reason why successful conception took about 4 years post her marriage. As per a western astrology principle, 4th House should also be considered for the desire of parenthood, to be very specific - motherhood. In her case, Lord of the 5th House Saturn is in Rahu's constellation Ardra and Rahu is placed in the 4th House. She is currently under the influence of Rahu major period. According to Ganesha, Aishwarya will have to be extra careful throughout the gestation period for the following reasons. 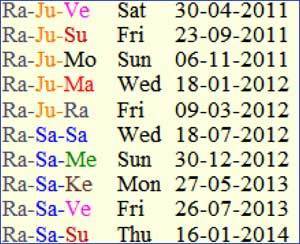 Rahu major period, sub period of Jupiter and sub sub period of Venus will rule till 22nd September, 2011. Here, Rahu is in the 4th House of nurturing, Jupiter is debilitated, thus weak and Venus is afflicted by Rahu. Second sub period will be of Sun, which is debilitated in the 2nd House of the family. Third sub period is of Moon, which is afflicted by Rahu. Ganesha predicts that the delivery may not be normal, and is likely to be a surgery. In a nutshell, Aishwarya is likely to face some complications during her gestation period, feels Ganesha. Ganesha's best wishes are with the Bachchans, and may the new entrant in the family - baby Bachchan bring lots of happiness, peace and prosperity in their lives.